Manchester’s Haçienda club is now (a touch symbolically) luxury flats. The 24-hour party people, the raves and raids are but 25-year-old memories. Yet its music refuses to die. Its leading lights may now be on the pensionable side of 50, but instant-sellout reunions seem to be annual events in the city’s musical life. Not usually on this scale, though. Haçienda Classical reimagines all those dancefloor hits as mega-orchestral production numbers, mashed together in one continuous, 90-minute stomp. From 9pm to 10.30pm on Friday evening that pounding, 120-beats-per-minute pulse didn’t stop. 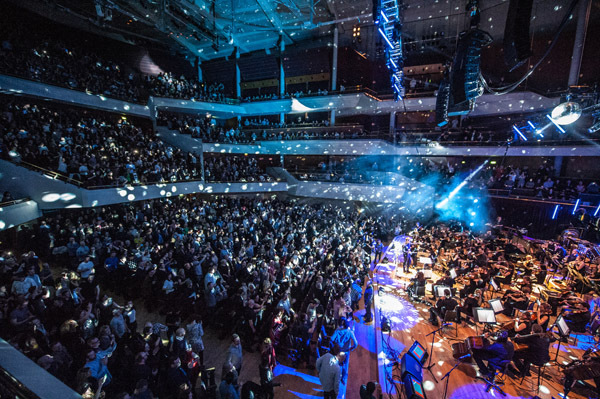 Nor did the 70-strong Manchester Camerata, probably Britain’s most adventurous orchestra, weaned away from its Beethoven by conductor Tim Crooks’s rambunctiously stylish transformations of Blue Monday, Voodoo Ray and many other Eighties and Nineties club-thumpers. Not that you could hear those strings soaring (or sawing) most of the time. The atmosphere in the normally sedate Bridgewater Hall was incredible. Imagine the crowd noise during extra time in a cup final between United and City, only ten times louder and visually matched by 2,000 people in a dance frenzy. I feared for the balconies. It wasn’t only the orchestra on parade. Like ancient mariners setting out on one last storm-tossed voyage, the ghostly luminaries of the Haçienda’s heyday rode the crest of this tumultuous wave. The balding DJs Graeme Park and Mike Pickering lorded it high above the orchestra. Peter Hook, co-founder of the Haçienda, croaked the vocals in Blue Monday. Bez, his political aspirations temporarily on hold, writhed across the stage, his arms seeming to snake in all directions at once. And for the grand finale Shaun Ryder resurrected Happy Mondays’ Hallelujah and Rowetta Satchell led the multitude through You’ve Got the Love. If you want the love, Haçienda Classical is touring about 20 UK venues this year, including the Albert Hall in London on March 23. It’s quite a show.